Following three days of testimony by County witnesses, the Local Planning Appeal Tribunal has approved a settlement on the Walker Environmental Group (WEG) appeal of OPA 197. 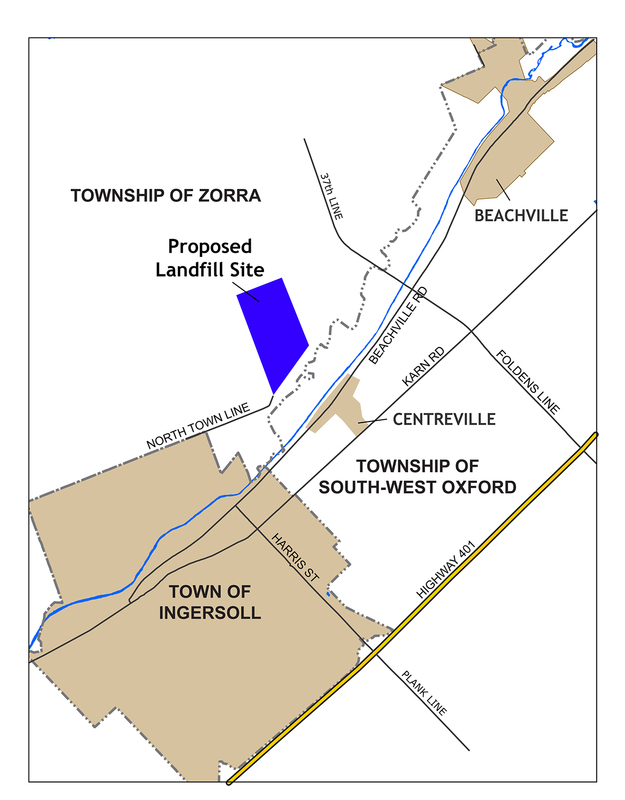 The Joint Municipal Coordinating Committee (JMCC)is the voice of the municipalities most directly affected by a proposal for a large-scale landfill in Southwestern Ontario:Zorra Township, theTown of Ingersoll, theTownship of South-West Oxford, and theCounty of Oxford, which comprises Oxford's eight local area municipalities. What is the Southwestern Ontario Landfill Proposal? The landfill proposal wassubmittedin March 2012 by Walker Environmental Group. The proposed site of the landfillis in Zorra Township bordering the Town of Ingersoll and South-West Oxford Township. Known locally as Beachville Lime, the site is owned by Carmeuse Lime (Canada). On March 17, 2016 the Ontario Ministry of the Environment and Climate Change (MOECC) accepted the Terms of Reference for Walker Environmental Group’s Southwestern Landfill Proposal. This allows the proponent, Walker, to conduct an Environmental Assessment (EA). This process involves the proponent completing technical work plans and studies to determine if the landfill can be constructed and operated safely. On March 18, 2016, JMCC Chair and Mayor of Zorra Township, Margaret Lupton issued a formal response to the MOECC’s decision, expressing disappointment with the decision. Oxford is not a willing host to the landfill proposal. In fact, Oxford County is making a tremendous effort to minimize waste within its own borders through its commitment to becoming a zero waste community as part of the Future Oxford Community Sustainability Plan. The JMCC is committed to following EA process and will be drawing on the expertise of each of the members to review and comment on the Environmental Assessment. Agroup of concerned citizens and business owners haveformed theOPAL Allianceto oppose the project. The group isworkingwith other county and provincially-based groups concerned about the landfill proposal. The OPAL Alliance is a group of concerned citizens and business owners who have joined together to oppose the proposed landfill. The group is working with other county and provincially-based groups. Peer Review Report: Review of Southwestern Landfill Proposal Environmental Assessment Draft Terms of Reference. Submitted by the Joint Municipal Peer Review Coordinating Committee . Peer Review Report: Review of Southwestern Landfill Proposal Environmental Assessment Revised Terms of Reference Dated 29 August, 2013. Submitted by the Joint Municipal Peer Review Coordinating Committee. Letter containing final Peer Review Team comments on the August 29, 2013, Terms of Reference Amendments and related recommendations. Prepared by Haussmann Consulting for the Joint Municipal Peer Review Coordinating Committee. The Joint Municipal Coordinating Committee is the voice of the municipalities most directly affected by this project. The Committee was formed with the express purpose of overseeing and directing the work of the Peer Review Team for the landfill proposal's Environmental Assessment. This process will unfold over a period of time. Please check back for further updates. Questions or comments for the Joint Municipal Coordinating Committee?